Recently I came upon an artist in my virtual travels his name is Abdullah Chhandeh through his music but that is just a glimpse of the many gifts and talents he shares with the world , I look forward to sharing them with all of you, below is just a glimpse of the man, his life and music . Also visit my page highlighting Abdul's cinematography work. "What Abdullah Chhadeh hoped to bring to the West was the complexity and beauty of the arab culture, and the instrument that called to him to do so, was the Qa’nun. Originally a student of math and physics, he thought his artistic pursuit would be painting, though he also studied the arabic oud. Yet at a fateful concert, he lost his concentration while playing the oud, captivated by the musician to his left, playing the Qa’nun. Intrigued by the sound, he told his mother about the dauntingly expensive instrument, and without hesitation, she sold her wedding jewelry to help him acquire one. He approached a well-known teacher, Selim Sarweh about becoming his student. Sarweh was hesitant about accepting a new student, already 22 years old, and told him “that he would be better off going home and selling tomatoes.” Undeterred, Chhadeh convinced him to tutor him for two sessions, and his recognizable talent brought Sarweh to take Chhadeh on as his student who would go onto the Conservatoire Damascus. Innovative and creative to his core, he began to change the Qa’nun itself, making it truly his own instrument with five octaves instead of the traditional three and a half. Believing in the possibilities of his music, he began composing, and writing lyrics; a dedication to the whole of the art. His reputation as a virtuoso in the instrument, and as a Syrian musician, brought him to play for the Syrian Embassy, where the discovery of his talent gained him entry to the Guildhall School of Music. From there, he began working on the musical culture that he wanted to bring to the West. As well as performing solo at World Music Festivals and concert halls across Europe, North America, and the Middle East, he began recording projects, creating his own ensembles to bring back the experience of instrumental trios and quartets, as opposed to synthesized and keyboard accompaniments. Abdullah Chhadeh and Nara was formed in 2001 to perform at the WOMEX music festivals. Later on, focusing on the Arabic nay, accordion, and percussion, as well as a double bass as part of project, it yielded the album, “Seven Gates,” a tribute to the seven gates of his home city of Damascus. In 2008, he created the Syriana project, again inviting a guitarist, arab percussionist, and a bass to share in his music and lyrics with a more modern approach. Taking cultural exploration one step further, he invited the Western musicians to his home in Damascus for ten days, hoping to create a documentary film of their impressions, as a well as encouraging them to bring back their experience to the UK. The album was released on Real World Records in 2010. Chhadeh divides his time between Europe and his home city of Damascus. With new projects in photography and film in extension of his music, his art is an ever-evolving process of creativity, communication, and discovery. "After a short break, Abdullah Chhadeh and Nara came to the stage. For this 2004 Canadian tour Chhadeh, a Syrian composer and virtuoso qanun player, is performing with his 4-piece ensemble Nara: Sami Rizkallah (Lebanon) on the Arabic Nay (NIE) flute, Ibaa Abu Khalaf (Palestine) on Arabic percussion, Bernard O’Neill (Ireland) on the double bass, and Simon Webster (UK) on drums. Abdullah makes a striking appearance with his long flowing jet black pulled back hair, longer than most rock stars. 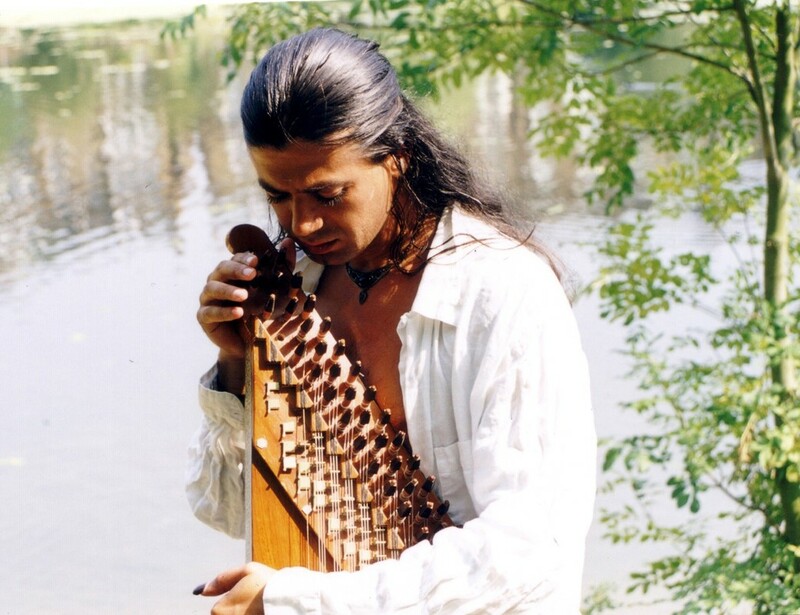 Dressed in traditional Arab shirt and pants, this guy with his hot looks, charisma, and his virtuoso level talent on the qanun Arabian zither, and touch of political edge could just as easily cross over to play with any symphony, as to play with a mainstream rock band. The qanun, an ancient Arabian zither or harp, is a trapezoid-shaped flat sound box with 81 strings, and is considered one of the most important and characteristic instruments of the Arabic world. We loved their music!